By way of introducing two charts I’m routinely using to suss out how companies are financed – the twin pillars of debt and equity – I need to return briefly to my last article on hire firms. In the main, tool and plant hire firms serve the construction industry which is notable for its instability. If builders aren’t building, they don’t need equipment any more and the whole point of hiring a piledriver rather than buying it is you can hand it back. Many of the hire firms had boomed and brushed with disaster over the period but one, Vp, stood out because of its Teutonic stability. The legend shows I’ve plotted some hideous sounding statistics of my own devising. You can add, subtract, divide, multiply, and compare pretty much any variable with another in a SharePad table or chart by clicking the “Combine items” button when you choose the first variable. It’s one of SharePad’s half-hidden glories. In this chart, I’m comparing net financial obligations and capital employed to derive a measure of gearing that shows how dependent on outside funds a firm is. 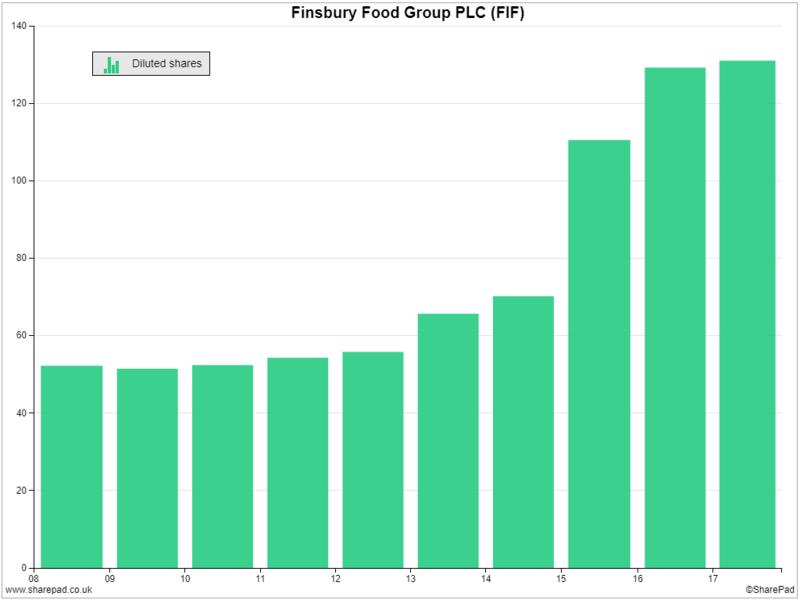 The black bars show what I consider to be the firm’s total financial obligations as a proportion of capital employed. This is net debt plus an estimate of the value of leased equipment and money owed to the pension fund. 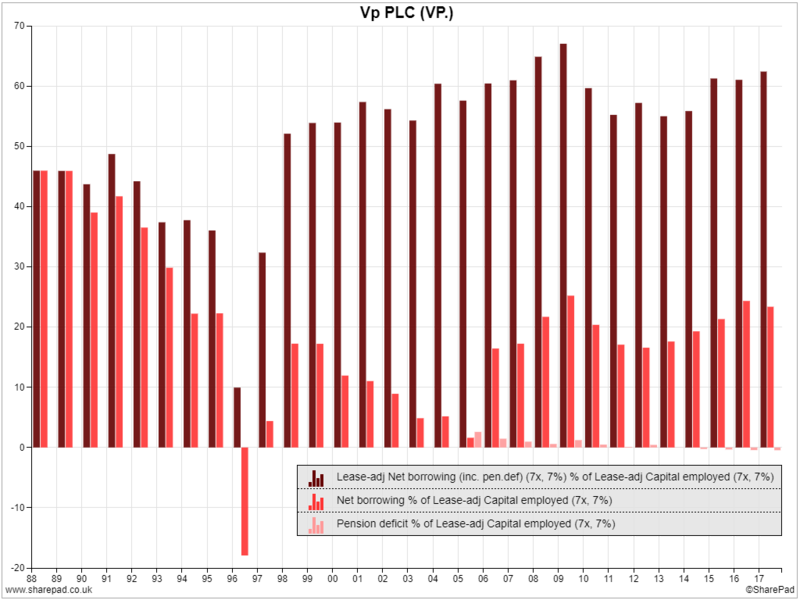 The red and pink bars show borrowings and money owed to the pension fund respectively – both also as a percentage of capital employed. Vp’s small pension fund currently has more funds than it needs, so the financial obligation is negative and we can ignore it. Vp’s total financial obligations, and its borrowings alone, plummeted in proportion to the capital employed by the business around the same time as my correspondent began to lose faith in it. In 1996, Vp had negative borrowings (i.e. net cash). The chart may corroborate his memory. Selling assets would raise cash and reduce debt, other things being equal. The earliest annual report I can find for Vp dates from 2001, when it was already recovering. It makes interesting reading. VP had acquired a number of specialist hire firms and sold the general plant hire business that made its name – hence the change of name from Vibroplant to Vp. Vp’s origins were in the post-war motorway building boom; its original name was Vibratory Roller and Plant Hire and it hired out road rollers. This business was probably much less profitable once the roads had been built, hence Vp’s sticky transition into specialist niches, a strategy that has served it well since. Maybe it overreached as my correspondent remembers, certainly shareholders lost faith. I can understand why, but it looks like Vp was searching for a more stable business model. Hindsight suggests it succeeded, at least for the following seventeen years, even though shareholders temporarily lost faith again after the financial crisis. More dependent on external funding now than twenty years ago. The mix of funding has changed. It is less dependent on borrowings and more dependent on leases. The mix of funding may have implications for our analysis but I must admit I’m wary of Vp’s 60% dependence on external funding at the end of its last financial year, especially as it has just borrowed significantly more money to make the largest acquisition in its history. Sometimes you don’t need to plot a handful of variables to get the picture. Here I’ve just selected one, average diluted shares in issue. There’s a sharp increase in the average number of shares in baker Finsbury Food in the year to June 2015. This is because a third of the way through the financial year, in October 2014, the company issued nearly 60,000 new shares, almost doubling the share count, and placed them with fund managers. It sold them in other words and used the money along with some borrowed funds to buy a company called Fletchers. 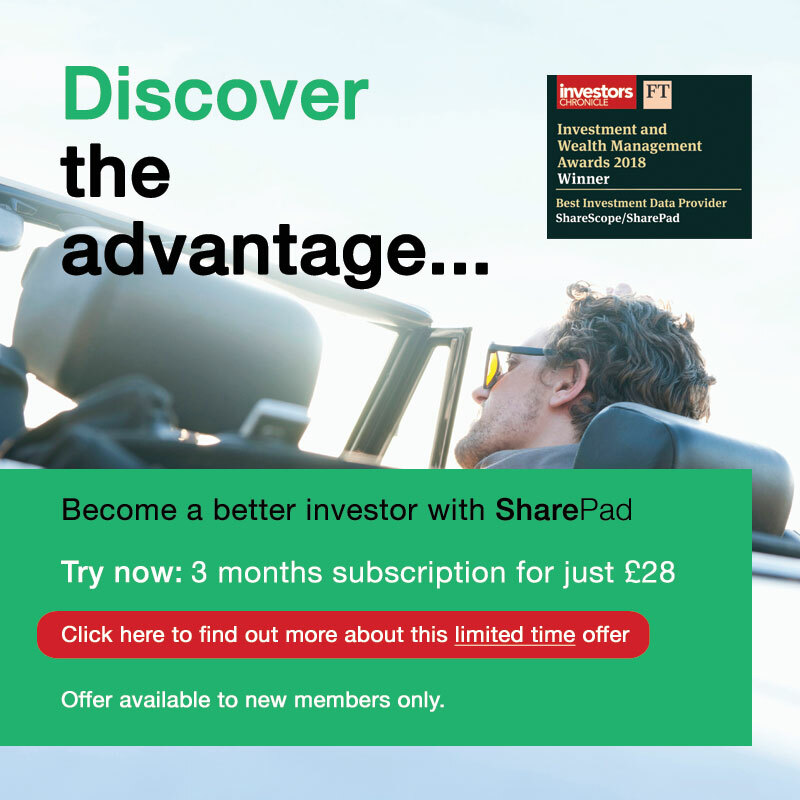 Because the placing happened part way through the year the average number of shares for 2015 does not incorporate the full impact of the placing, which is why the number of shares is higher still in 2016. When a company issues more shares, the profit that the combined entity earns and the dividends it pays will be spread over more shares, reducing the return attributable to each one. If the acquisition disappoints, and the profit Finsbury bought is not sufficient, earnings (profit) per share will fall. It’s early days yet, but the signs are reasonably good for the Fletcher acquisition. Finsbury has increased earnings per share in the three years since the acquisition and it is earning a higher return on capital too.